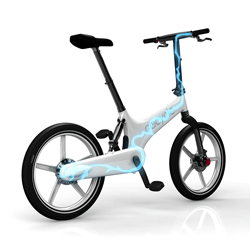 We are now marketing this unique electric bicycle to the Super Yacht and leisure industry,s we have selected the product due to advanced design and quality. These unique characteristics make this an ideal addition to a superyachts "toys",we can supply the cycle in a range of standard colors as well as custom color schemes and branding to match a specific yachts color scheme. 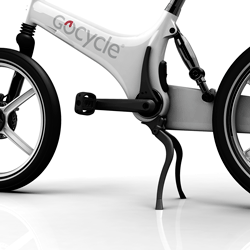 Gocycle® is the fusion of its designers day-to-day experiences living in London, his expertise in lightweight vehicle design and his insight into the market opportunity of providing better city-specific mobility solutions. Having commuted by cycle for many years, he could attest to the freedom that comes with riding a two-wheeler. But I having also had many unpleasant experiences with traditional bikes, such as arriving to work hot and sweaty, having to change from cycle to office clothing, getting dirty chain grease on his pants, fixing a messy flat tyre, having two bicycles stolen within six months, and even being heckled for riding "one of those funny looking fold-up bikes"! 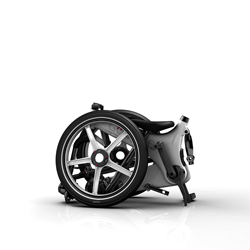 In January 2002, due to his total dissatisfaction with traditional bike design compelled him to leave McLaren Cars Limited, and from a one bedroom London flat,began to develop a new class of powered two-wheeler designed specifically to meet the needs of the modern city dweller. 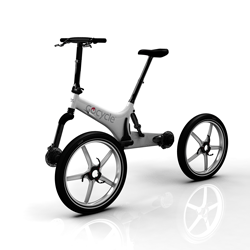 Gocycle combines power, portability and style—and makes cycling fun! 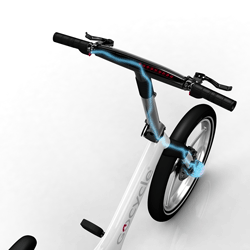 This unique combination of benefits sets Gocycle apart from the competition.